Denial: a stage in keeping a Lenten discipline. Here's another way I've been denying my Lenten discipline: I stopped logging the repeat offenders. The Bundaberg ginger beer, the plastic sleeves of Thin Mints... I told myself I would stop or reduce my use of them, but I haven’t. You know what else is single-use plastic? Double-sided tape dispensers, acrylic paint, for starters. I haven’t even dared to look at my art practices when it comes to single use plastic. Lent stops at my art room door. There’s a mighty long river in Egypt and in keeping a Lenten practice and they're both called denial. What to make of this? I wrote in my journal at the start of March that my intention is to be a better steward of the resources of this earth, through reducing plastic waste and food waste. 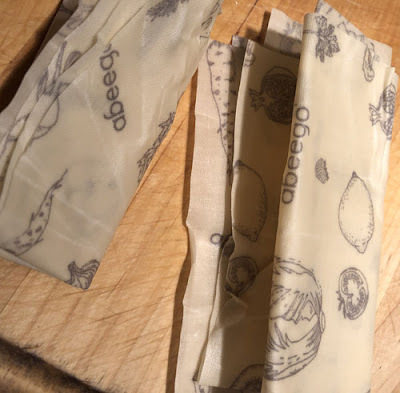 And I am doing better: I use beeswax wraps, silicone straws and bags, cotton mesh produce bags, ceramic mugs to drink from, bento boxes, small glass bottles of milk, dental floss made of silk instead of polyester and cutlery (silverware) that I take to/from work... These are all accomplishments. These are all ways I am reducing my use of plastic. That ain't nuthin'! I can't deny where plastic continues to persist in my life. If I am going to use a repeat of a single-use plastic item, I will note it. For every repeat item, I will write to the manufacturers and ask: why is this necessary? I knew going in that this wasn’t going to be like the year I drank only water and donated the savings to a clean water program. I knew that this would open my eyes to plastic (and then some), but I didn’t expect that I would become so overwhelmed that I would turn a blind eye to it and just continue to use items that had single-use plastic within them.